Does the Olympus E-PL5 compact system camera live up to the billing of being a 'Lite' version of the flagship Olympus OM-D? Offering the power of a DSLR within the dimensions of a near pocket compact, the maker's latest retro-styled compact system camera arrives in the Olympus E-PL5, also known as the 'Pen Lite'. 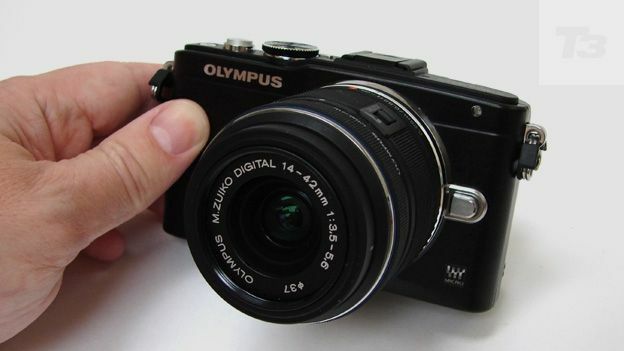 It's the direct successor to last summer's Olympus E-PL3, as there was no E-PL4. Headline resolution has been boosted from 12 to 16 megapixels, there's the ability to shoot at eight frames per second for action photography, and the top light sensitivity has been boosted to ISO25600, up from ISO12800 previously, to enable greater clarity of results when shooting using natural light only. The metal-bodied E-PL5 sits in the middle of a range of near-DSLR quality cameras that still includes the year-old Olympus E-P3 just above, while topping the range there's the well received if £1000+ Olympus OM-D E-M5. Below the E-PL5 sits the equally new E-PM2, or 'Pen Mini', aimed at absolute beginners or those simply wanting an ultra compact yet creatively flexible shooting option. The target audience for the E-PL5 is similarly the photographer upgrading from a point and shoot or smartphone. Indeed, on release Olympus was bundling a 8GB Toshiba FlashAir Wi-Fi card with the camera to provide the now requisite 'always connected' feature, rather than building wireless connectivity into the body. That's something we've seen recently with the likes of the Sony NEX-5R and Sony NEX-6, along with the Samsung NX1000, Samsung NX210 and Samsung NX20.In light of the stiff competition, Olympus is playing a marketing ace pitching the E-PL5 as essentially an OM-D in more user-friendly form. The 16 megapixel CMOS sensor and TruePic VI processor are the same; with the only core difference being the in-body image stabilisation system on the OM-D is more evolved than the one we have here (five axis on the OM-D as opposed to dual axis on the E-PL5). There's also the fact that the E-PL5 misses that more expensive camera's gloriously solid-feel build quality plus enthusiast-pleasing built-in viewfinder. But of you're not a photo enthusiast you probably won't miss it. Suggested pricing for the Olympus E-PL5 Pen Lite is £599 with the retractable 14-42mm II R zoom lens, which offers the equivalent focal range of 28-84mm on a 35mm camera and comes equipped with a locking mechanism to ensure maximum compactness even when attached to the camera's Micro Four Thirds system mount. This means the lens needs to be unlocked and barrel unfurled before the first shot can be taken. Fine in theory, but how does it work out in practice? Looking attractive from the front if not quite as standout gorgeous as the OM-D, the top plate of the E-PL5 finds room for a hotshoe for accessory flash - with a small clip-on variety provided in the box in lieu of an actual built-in variety. We also get a shooting mode dial in a prominently raised position with a full complement of manual controls alongside the fully automatic point and shoot options. Immediately obvious large and springy shutter release button with smaller power button sit alongside. An immediate plus point in the Olympus' favour is that it powers up nigh instantly, so, as with an actual DSLR, if you see a shot in your mind's eye you're less likely to have missed it by the time you've got a finger to the shutter release button. While we've no complaints about the top plate controls on the E-PL5, it's another matter when coming on to those at the back. Here the operational buttons appear unnecessarily small and require fingertip precision. Fine if you're offering up a camera of credit card sized dimensions that's as much about minimalist style as substance, but we expected better. Having said that, luckily the rear LCD here is also a touch screen, so there is the option to simply tap the setting required rather than having to tab your way to it; a best of both worlds control option then. As mentioned above, the E-PL5 keeps up with the times by supplying a widescreen ratio LCD screen at the rear that is not only angle adjustable - in that it can be tilted up (through 180 degrees) or down (through 65 degrees), if not rotated - but is also a touch panel. This enables even the likes of the camera's shutter to be fired by tapping your subject on screen - the aptly named 'touch shutter' feature - the E-PL5 responding with a satisfying clunk. In the absence of any optical or electronic viewfinder for eye-level shooting (though in fairness an optional Olympus VF-2 viewfinder can be added at extra cost), the 3-inch size works fine as a tool for stills and video composition and review, with the 460k dot resolution likewise being perfectly adequate if falling short of class leading. The Olympus E-PL5 comes bundled with a BLS-5 rechargeable lithium ion battery and standalone mains charger, which is always welcome in these days of cost cutting and USB charging alone. As expected, this cell slots into a vacant compartment at the camera's base, just below the space for screwing on the accessory grip provided, which is shared with a slot for any variety of removable SD card. According to industry testers CIPA, battery life is good for up to 360 shots from a full charge, which is comparable with the very best of Olympus' rivals in the Sony NEX-5R, Samsung NX1000 and Canon EOS M.
A core feature of the Pen range is the lightning fast auto focus speed of 0.01 seconds, and the Pen comes across as responsive as you'd expect from a consumer DSLR. Art Filter effects are fun and effective, with warm, bold colours delivered almost on default and applied at the point of capture - which is also true when recording video, not just stills. The vivid saturation boosting options appear to work the best in our eyes. Olympus claims the new TruePic VI processor has speeded up the processing of such images, and certainly we didn't notice use of filter effects slowing the camera down; so the temptation is there to keep them as a default setting to add punch on gloomy days. We also enjoyed the ability to blur the background of a shot and achieve a DSLR-style shallow depth of field effect merely by dragging a finger over a sliding bar positioned on the right of the E-PL5's screen display. In essence the camera does a large part of what it claims to; namely it offers amateurs access to more professional looking images without an attendant steep learning curve. Another advantage is the second generation 'II' kit zoom bundled with the E-PL5. It's nigh-on silent when it comes to auto focusing during video and smooth with it, avoiding the stop start clunky-ness of the original iteration. Your framed subject gradually but rapidly comes into focus should you decide to point the lens at something else once recording has begun. Almost the same size as the equally new Canon EOS M, which will have the advantage in some purists' eyes thanks to a physically larger APS-C image sensor, the 16.3 effective megapixel Olympus E-PL5 has the edge for its charmingly retro styling, plus the fact that its backplate LCD can be angled for a more creative variety of shooting angles. The Olympus is also more reasonably priced at first glance for someone trading up from a simple snapshot camera to one with interchangeable lenses for the first time. With response times a match for most DSLRs too, there's comparatively little to find fault with when it comes to the E-PL5. That means that if you do find a good deal going, it can be considered a sound buy.